Discover Your Authentic Self is very organized, laid out in a tidy and logical manner and is pushing at the spine with content. True content. It always amazes us when we find an author who can fill a book with actual content. 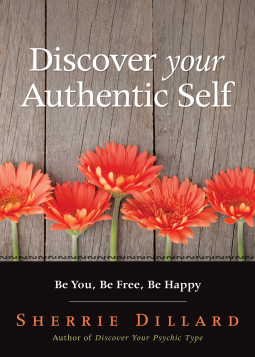 Discover Your Authentic Self is a dowsing book for the soul. The answer to the question who am I? lies in our underlying principles. If we can be true to our core values, we have a compass to guide us through life, and will never stray far from who we really are. But first we have to discover those basic values. At times we get a glimpse of our own pure goodness. If you feel as if it is time for a change, it is. If you find feathers, especially white ones, your angel is close. The random kindness and warmth of another can have a profound and positive effect on us. Trust joy when you feel it. Psychic since childhood, Sherrie has been a Psychic, Medium, Medical Intuitive and Teacher for over twenty-five years. Among her international clientele are spiritual leaders, celebrities and business executives. She has given over 50,000 thousand readings. Her books have been translated into eight languages and her writing has also appeared in national magazines such as Glamour, Huffington Post, Belief.net, New Age Journal and Yahoo home page. She has been featured on television, radio and print for her work a psychic and medium. Dillard believes that we are all psychic. She is the expert in understanding the various ways that intuition naturally surfaces and activating your most powerful and natural wisdom, your psychic knowing. Intuitive and psychic awareness provides beneficial guidance to better negotiate our way through our everyday lives. It also increases self-awareness as it connects us to the power of our spirit. Sherrie will empower you to tap into the divine within to harness your innate ability to co-create abundance, harmonious relationships, joy and well-being. Sherrie's passion for the fusion of intuition, spirituality and conscious self growth have made her a popular speaker and teacher at workshops, retreats and conferences both nationally and internationally. Dillard holds a B.S. In Psychology and M.Div. In New Thought Pastoral Counseling.